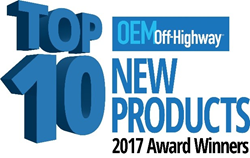 OEM Off-Highway™ magazine, the only global industry publication and website dedicated to the entire product development team of heavy-duty on- and off-road equipment manufacturers, has announced its official Top Ten New Products of 2017. The winners are the ten most viewed new products on the popular online product database, the Component Directory, oemoffhighway.com/directory. To date, the Component Directory features nearly 5,000 products and services from 1,800+ companies around the world. “It’s always interesting to see how diverse the Top Ten New Products end up being. As always, engine technology is the most important and searched system, but I was pleased to see user interfaces, electric motors, axles and other vehicle technologies represented. It goes to show that the product development team is always looking for the latest and greatest part, system or technology to set its vehicle design apart from the rest,” says Michelle Kopier, Associate Publisher, OEM Off-Highway. “It’s great to see winners from previous years bring their awards to major tradeshows and industry events and display them proudly at their booth. Our Top Ten New Product awards program is continuing to gain notoriety in the industry, and we have dozens of companies asking how to get involved every year,” Kopier says. and on its website,OEMOffHighway.com. Magazine subscriptions are free to qualified industry members. http://www.oemoffhighway.com/subscribe. Interested in making a submission for OEM Off-Highway’s™ 2018 Top Ten New Products? Email us at editor@oemoffhighway.com for more information. Since 1984, OEM Off-Highway™ magazine has delivered the latest news, products and emerging technologies to original equipment manufacturers’ (OEMs) product development team members. Editorial content concentrates on the critical issues and new product developments that impact the industry and provide the in-depth coverage and analysis that are of primary importance to readers. AC Business Media Inc. is a business-to-business media company that provides targeted content and comprehensive, integrated advertising and promotion opportunities for some of the world’s most recognized business-to-business brands. Its diverse portfolio serves construction, supply chain and other industries with print, digital and custom products, events and social media. AC’s brands include: OEM Off-Highway, Asphalt Contractor, Concrete Contractor, DHI ConNextions, Equipment Today, Pavement Maintenance & Reconstruction, Polishing Contractor, Rental, Sustainable Construction, ForConstructionPros.com, Food Logistics and Supply & Demand Chain Executive, DMN, Green Industry Pros, Snow Pro and the Supply Chain Learning Center.